Whew! 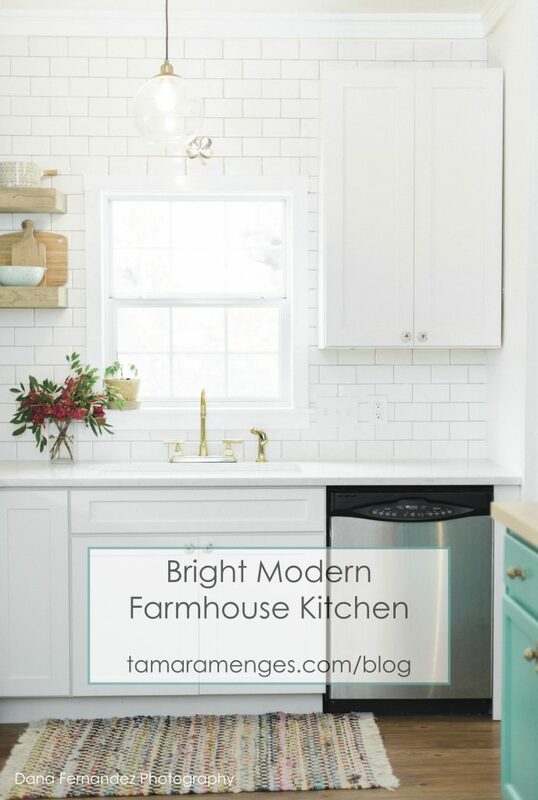 Am I excited to finally share our bright modern farmhouse kitchen with y’all! Our new kitchen it quite special to me for many reasons. Not only were we able to pay cash to renovate it, but Kason and I painstakingly took it from it was to where it is now together. It’s also an open concept, so I feel like I am with my family if they are playing at the table because our kitchen, dining, and living are all one big room! It’s filled with intentional items we actually use, which means everything has a purpose. 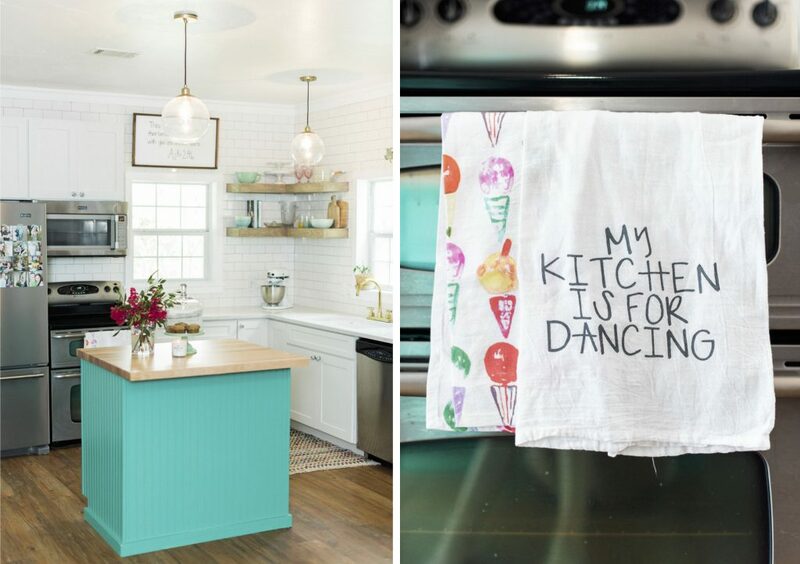 Lastly, from the handpainted colorful knobs to the bold island there are touches that you don’t normally find in the quintessential farmhouse kitchen, but they bring me joy. I honestly can say I smile everytime I’m in it! When we first looked at our new home, I knew it was the one, atleast I was really praying it was! K and I have dreaming of a charming farmhouse for years. 🙂 However, the kitchen needed some work, and thankfully with the sale of our first home we had about $8,000 to put into our new one. We knew it would all go in the kitchen which also meant we had to do the work ourselves, and find economical finishes, and stay on budget. Getting a loan for a kitchen remodel was not an option, so we had to make sure we were smart with what we chose to use. Thankfully, for our budget, I’m not one to obsess over brands or high-end finishes. I just wanted a certain look, and that look was a bright, modern farmhouse kitchen. I wanted timeless finishes so that if my design tastes change over time, it would be much easier to update with a clean white palette. Also, our kitchen has a very small footprint, so there weren’t a ton of cabinets needed or square footage for the quartz countertops which helped out a lot with our small budget. Let’s dive in to these details! 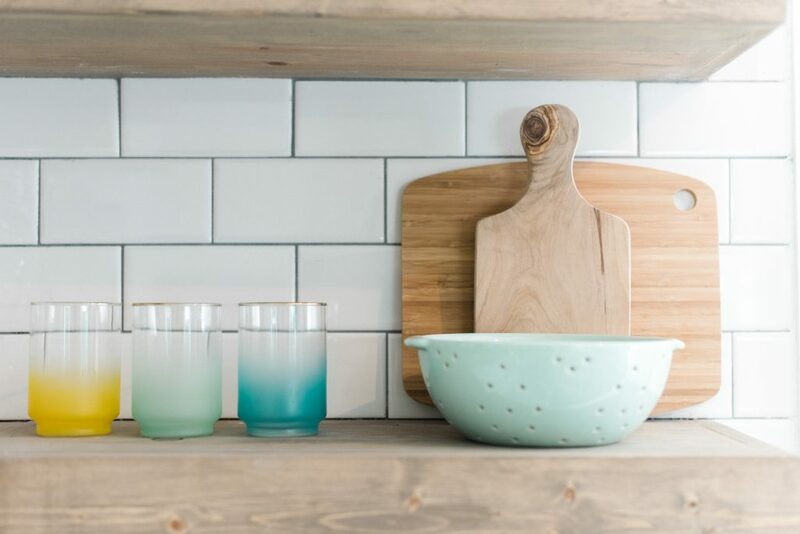 Every time I searched farmhouse kitchens for inspiration I was bombarded with all whites, greys, and shelves filled all white dishes, and rusty vintage kitchen scales. I kept coming back to the fact that I want our home to be intentional, not showy, or look like I raided an antique store. I also knew I wanted mostly white, but I also really wanted some color and personality too. Enter the bright aqua island! I tried out peach, and hated it! But that’s the great thing about paint, you can just try again! I also wanted to break up the white quartz counters with butcher block on the island. 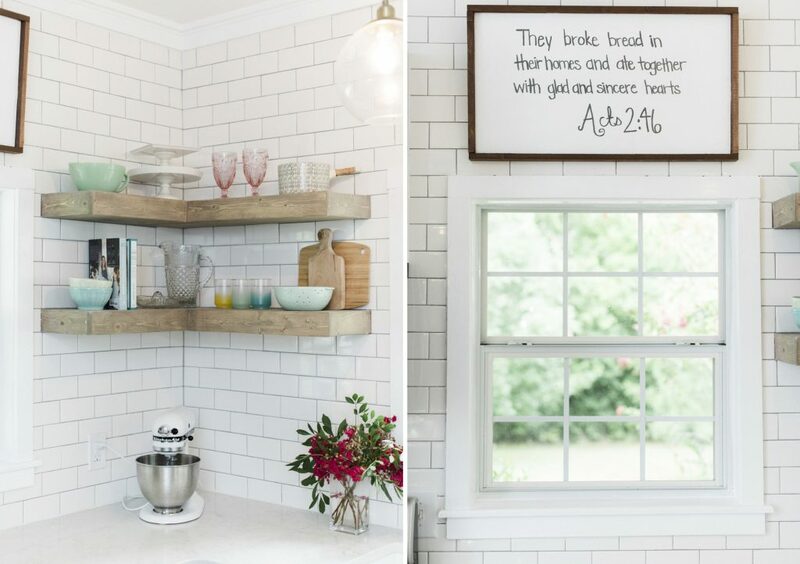 Those gorgeous corner floating shelves were built by my friend Alyse Morrissey! Aren’t they fabulous! I have our shelves styled with only intentional items that I actually use, or sentimental pieces. For example, the to the left of the crystal pitcher is a juicer that my aunt gave me years ago that her, my dad, and their other siblings used on their farm when they were children. Since moving I haven’t made a new friend who can do hand lettering for me, but I knew I wanted this scripture in our kitchen so I tried my hand (no pun intended!) on writing it out. This is a cabinet door from the original kitchen with a simple frame we built around it! 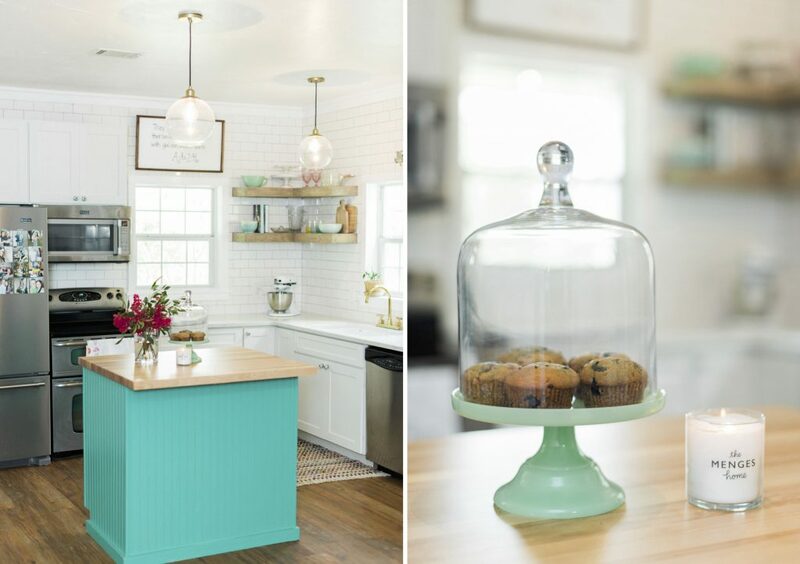 I love repurposing part of the old kitchen, especially since there was a lot of heart that went into building this home by the former owners. Gold! 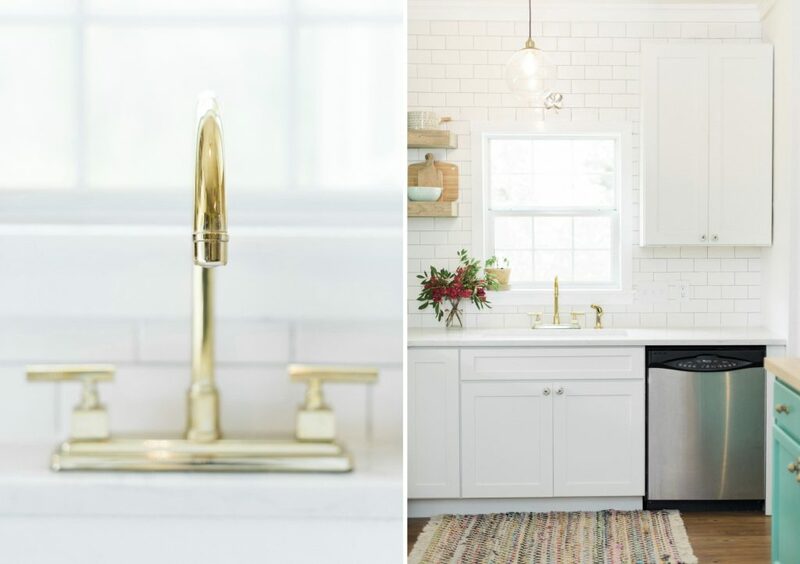 I was so excited to find this gorgeous gold faucet over at Wayfair! The classic and crazy affordable white subway we bought at Home Depot, and we wrapped the entire corner of the kitchen all the way to the ceiling. 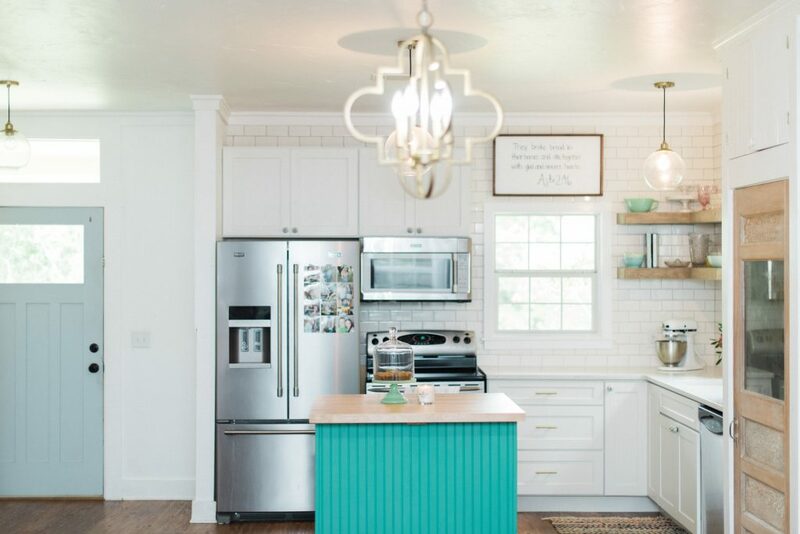 The amazing white cabinetry is from Cliq Studios, solid wood and oh-so-gorgeous! 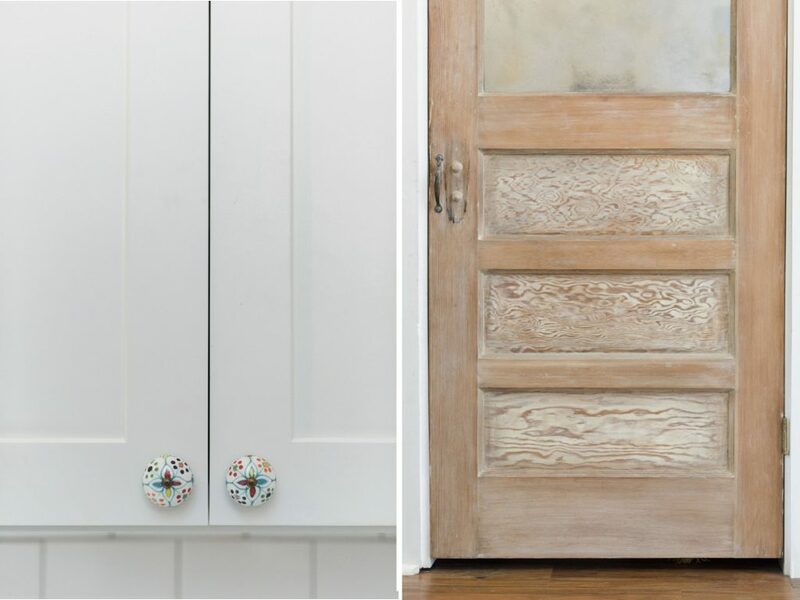 Oh goodness, I love these hand-painted knobs! They are so colorful and full of personality, and from Hobby Lobby! No joke, I looked at Anthropologie, and liked several of theirs, but when I found these I scooped them up! This door y’all, was a serious labor of love! We LOVE that the former owners put so much character into the home even though it was built in 2008. There are vintage doors throughout, including this gorgeous girl! She was painted, and I wanted to have another element of natural wood. So a nasty toxic can of paint stripper, super thick rubber gloves, and a lot of elbow grease later, she is gorgeous! The window was also clear glass, and I wanted it to not be. The former owners had a cute tea towel hanging in it, but I wanted something a bit different so I created a mercury glass look on the glass. While it was laying down in the grass flat, I lightly sprayed it with a little vinegar so there was more concentration in areas, and less in others, then sprayed “looking glass” spray paint over it and let it dry in the sun. Then I repeated it again a couple times, and also sprayed a little gold on as well for one layer just because I have gold accents elsewhere. Once I achieved the look I liked, I back it with black chalkboard board. All of this was done on the inside on the door, not the outside. So when I open the pantry door up, I have another scripture from Proverbs 31 on the inside of the door! Super simple project to finish off the door. So there ya have it friends! I know some of you have been asking me when I was going to post, it’s not that I wanted to wait until it was “perfect,” but I did want to wait until it was complete. And once we actually moved in, projects slowed down dramatically! We literally finished all the tiling and grout just a few weeks ago! But I adore how it turned out, it’s everything we need and nothing we don’t. 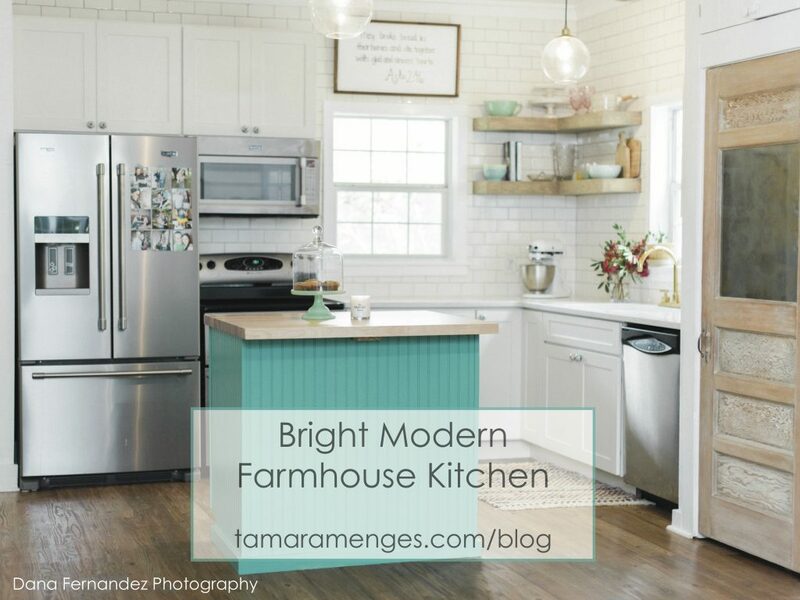 Lots of memories have already been made in our bright modern farmhouse kitchen, and I am excited to make countless more! If you missed our sneak peek of our legacy film, check it out here!